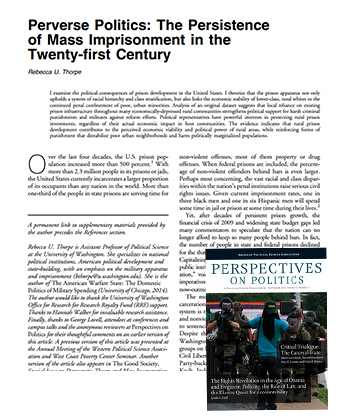 This paper examines the political consequences of prison development in the United States. It theorizes that the prison apparatus not only upholds a system of racial hierarchy and class stratification, but also links the economic stability of lower-class, rural whites to the continued penal confinement of poor, urban minorities. Analysis of an original dataset suggests that local reliance on existing prison infrastructure throughout many economically-depressed rural communities strengthens political support for harsh criminal punishments and militates against reform efforts. Political representatives have powerful interests in protecting rural prison investments, regardless of their actual economic impact in host communities. The evidence indicates that rural prison development contributes to the perceived economic viability and political power of rural areas, while reinforcing forms of punishment that destabilize poor urban neighborhoods and harm politically marginalized populations. Although there is a perception that rural prisons help the economy, substantial examination of that premise shows it to be flawed. In particular the work of Greg Hooks, et al, at Washington State U, shows that the presence of rural prisons actually harm the economy, when compared long term to adjacent or otherwise similar counties in the states where they are located. Terry Besser at Iowa State did similar work, as did the Sentencing Project. There are many rural communities that not only have prisons that deter better paying and safer industry from locating there, but they have empty prisons that do so, without contributing a dime to the economy. The largest of the for-profit operators, GEO Group, Corrections Corporation of America and Management and Training Corporation, have left these derelict facilities littering the national landscape. Here’s the bottom line for CCA: Examples include Appleton, MN, Walsenburg, CO, Beattyville, St. Mary and Wheelwright, KY, Watonga, OK (with Sayre scheduled to close, this year). These vacant prisons are not typically shown on their corporate website, though they do fess up at stockholders’ meetings. given the SEC’s requirements. They have also mismanaged state and federal contracted facilities, often owned by local economic development corporations, which eventuated in closings, such as in Greenwood, MS (CCA), Eagle Mountain (CA), abandoned by MTC, Willacy county (TX) MTC, Baker (CA) which GEO sold, but the prison, barbed wire and all, remains a blot on the landscape.